Agn/Eğin (present-day Kemaliye), 1914. Mariam and Haroutyun Narlian, and their daughter Arshaluys (Source: Bedros Kasparian collection, Cyprus). This article is an effort to study and to bring back to life the traditional attire of the people of Agn through successive historical periods. Agn’s sartorial traditions, and the daily attire worn in the area, were influenced regularly by migration patterns and population movements, interactions with neighboring national and ethnic groups, etc. The scant information we have on the attire and sartorial culture of Agn District allows us to gain a deeper understanding of the lifestyle, customs, and traditions of the area. After the wave of immigration to Agn from two of the largest population centers of historic Armenia, Vaspurakan and Ani (which occurred, according to Arakel Kechian, in 1021 and 1300-1321, respectively) , immigrants brought with them their unique sartorial customs and traditional attires, which they preserved for some time in Agn. But in later years, the influence on the district often came from more foreign sources . After the conquest of Constantinople, residents of Agn began visiting Constantinople more frequently, and some even held high positions in the Ottoman government. The people of the district began adopting the fashions of the capital and to dress in official attire . This type of attire consisted of flat collars and fringed jackets; the shalvar (sagging trousers); the hermani (long coat); the djyubbe/cübbe (gown of coarse cloth); and furs. Headgear included the pagegh and the kavouk, belts were worn at the waist, and footwear included the mest and the lapchin (half boots), and in later years the potin galosh (galoshes). Over time, the jackets and the shalvars were gradually replaced by the European stanbolin (a type of frock coat), the redingote (a long and wide coat for men), and the bonjour (suit reserved for social calls). 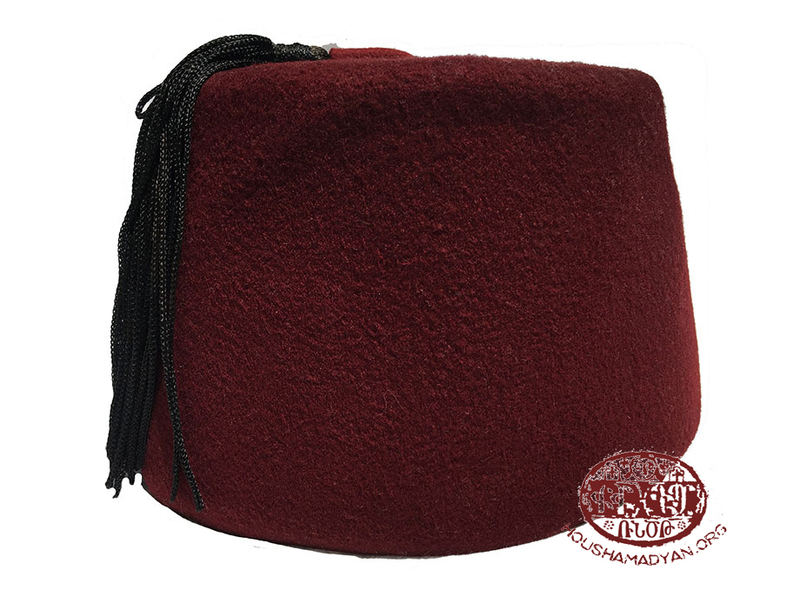 The kavouk and the pagegh were replaced by the Ottoman fez . Children in Agn. Detail from larger photograph (Source: Jamgochian collection, USA). 1) Agn, circa 1892. Eliza Jamgochian. Detail from larger photograph (Source: Jamgochian collection, USA). 2) Agn, circa 1890. Margarit Jamgochian (Source: Jamgochian collection, USA). 3) Hayganoush Kechian (née Kharasandjian), wife of Arakel Kechian (author of historical workds on Agn), in traditional Agn dress (Source: Arakel Kechian, Agn yev Agntsin, 1020-1915 [Agn and the People of Agn, 1020-1915], Volume I, Bucharest, 1942). Silver bridal belt, from Agn. The belt once belonged to Almas Kaboulian. After Almas’s death, the belt was passed on to her daughter-in-law Rosa Kaboulian (wife of Kegham Kaboulian), who later brought it with her all the way to the United States. 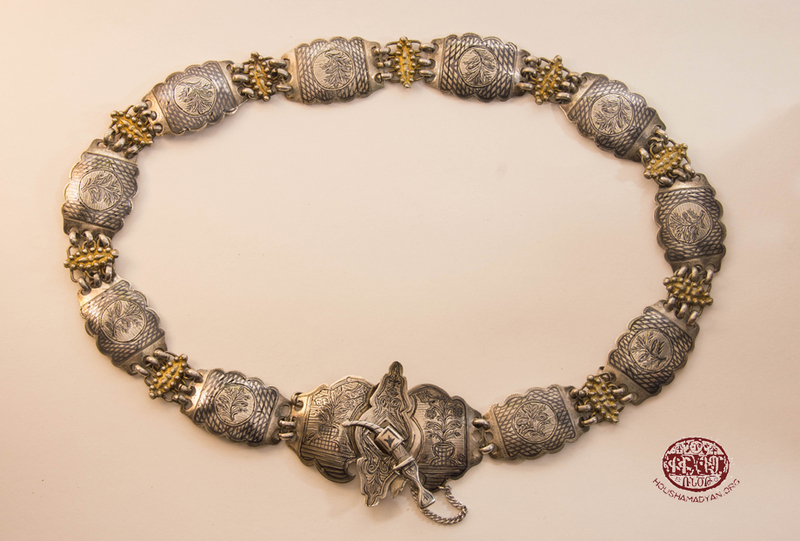 Today, the belt is kept as a family heirloom in the United States (Source: Kaboulian collection, USA). Therefore, there were two types of attire in Agn – modern attire imported from Istanbul, and traditional attire. The latter consisted of the shalvar, the entari (long overcoat worn by both men and women) or the zboun (women’s overcoat), the hermani or the salta (short overcoat for girls, young brides, and young grooms), and the choubba for the winter, the latter sometimes lined with fur . According to Kechian, during the era of the Amiras (16th-18th centuries), the men of Agn began paying more attention to the attire and appearance of their wives than to their own. When they married, women left their maternal home with valuable dowry that included clothing and jewelry. They would also collect additional items that they received during celebrations, upon their husbands’ returns from abroad, and on other occasions. They would wear these items for many years thereafter. These included various heavy furs, dresses made of wool or silk, undergarments, and gowns, which were often adorned with needlework of golden thread. A woman gifted her daughter most of her wardrobe and jewelry upon the latter’s marriage. Women’s attire usually consisted of the following elements: undergarments that compressed the torso, covered by a delicate gown of silk thread. This gown covered the entire body, from shoulder to foot, with the exception of the breasts and the arms. Over this gown women wore the heavy badmudjan (overcoat), decorated with floral themes or needlework, and which also covered the entire body except for the breasts and arms. The edges of women’s undershirts would extend beyond the hems of their gowns, and would be starched and embroidered with patterns of lacework, which would blend in with the lower halves of their badmujans. The badmudjans, in their turn, would be embroidered with golden thread all the way down to the hems. The embroidered patterns in their attire, usually of red or yellow thread, gave women an exquisite appearance . Agn, circa 1889. 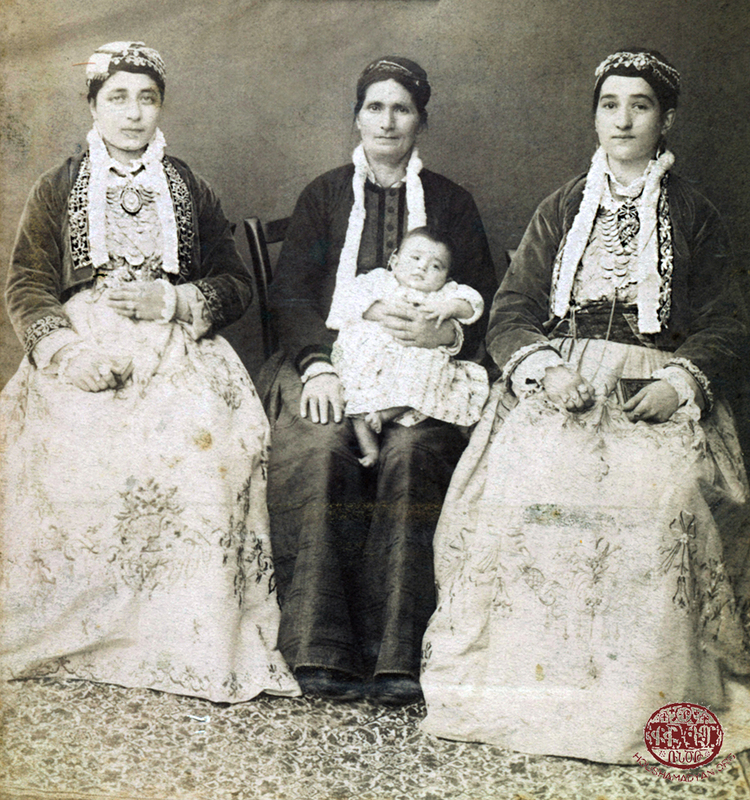 From left to right – Margarit Jamgochian, Margarit’s mother (name unknown) with Eliza Jamgochian in her lap(Avedis and Akabi Jamgochian’s daughter), Akabi Jamgochian (Avedis’s wife) (Source: Jamgochian collection, USA). 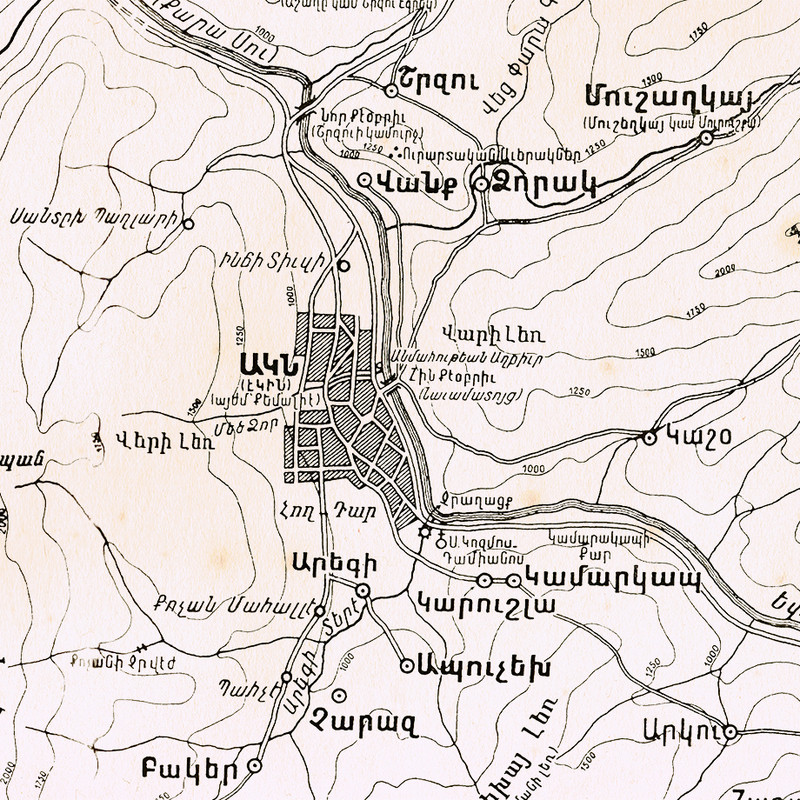 Map of Agn, created by Krikor Bahri (Source: Arakel Kechian, Agn yev Agntsin, 1020-1915 [Agn and the People of Agn, 1020-1915], Volume I, Bucharest, 1942). Children tied silver- or gold-colored belts around their waists. They would wear short fur jackets with fringes embroidered with golden thread, and which covered their abdomens and waists. In the frigid winters, on top of these jackets they would wear longer coats lined with the valuable furs of white or red sables, white martens, and foxes . The women of Agn decorated their hair by hanging golden tassels from it. They covered their heads with delicately woven caps, which were decorated by gold coins hanging from the front and strings of pears on top, with gold-laced fringes and diamond-fringed patterns . The chests of the jackets they wore were decorated with gold-threaded embroidery, and women also wore golden necklaces, which were called hink megnots [a fiver], hink ankam him megnots [five times fiver], or mahmoudie (mahmoudia or mahmoutia: a circular Turkish coin traditionally used as an ornament of gold on headbands that women wore around their foreheads) ferendez (one-quarter pound) coin. These ornaments were affixed to the embroidered fringes of clothing with the use of diamond stars. Ears were adorned with gold or diamond earrings; and the fingers with heavy rings, each with its own long history (a present from a father or a husband, who had brought it as a gift from Constantinople on the occasion of their engagement or their wedding, etc.) . But eventually, the era of the Amiras came to an end, and their authority was replaced by that of the Esnaf (this was the name given to guilds in the Ottoman Empire, from the Arabic word esnaf, meaning craftsman or workman). The people of Agn immediately felt their burdens increase, and became more inward-looking. As a result, they moderated their extravagances and altered some of their customs . 1) Agn, 1900s: Wedding photograph of Boghos Kaboulian and Rebecca Najarian (Source: Kaboulian collection, USA). 2) Agn, 1914. Mariam and Haroutyun Narlian, and their daughter Arshaluys. Note the scarfs used as belts by Mariam and Haroutyun. These scarves were usually imported from Persia (Source: Bedros Kasparian collection, Cyprus). After 1870, a new generation of Armenians passionately espoused the ideas of the Armenian national awakening. Many plays were performed, depicting the life of Armenian nobles. There were also many examples of nobles’ costumes produced, and these were very popular with the women of Agn, as they were more modest and more aligned with the local character. Perhaps for that reason, in later years, the prevailing fashion once again switched from traditional Turkish court attire to traditional local attire . But the traditional attire worn in 1870-1900 had sustained some changes. In the early 19th century, the importation of European customs and attire to Turkey had brought many new ideas, including in the mentality and views of the people. In particular, when women began earning their own money, their attitude towards valuable, classical attire and jewelry sustained a change. At the same time, on the advice of their acquaintances who had emigrated, they began copying European styles . 1) Agn, circa 1880. 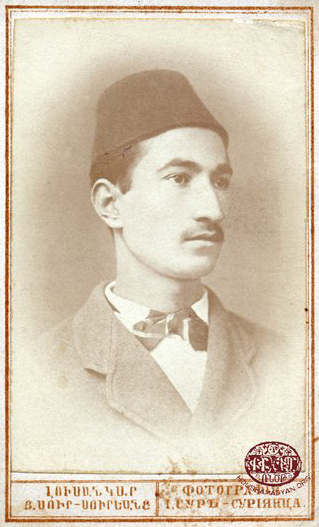 Avedis Jamgochian (1861-1940) (Source: Jamgochian collection, USA). 2) The invaluable marital gown that belonged to the mother of Armenian poet Siamanto (kept in the History Museum of Armenia) (Source: Flora Krikorian, Armenian National Dress [in Armenian], published by Andares, 2011, Yerevan). According to Hagop Djanigian, by the end of the 19th century, the customary attire of men in Agn consisted of a black kalpak (a small, tall, pan-shaped hat), a chashgher (a type of shalvar made of cloth), a belt, a choubba, and a pair of mest-paboudj (thin-soled shoes, sandals) . The customary attire of women consisted of the taghna (worn by maidens), a khasaba (worn by new brides), an overcoat, a belt or a Persian tspsi (a thick, coarse belt made of goat’s hide) around the waist, various fur-lined coats, birindjigs, shirts of linen and red cloth, and vodits-terlig (footwear). Djanigian mentions that the kalpak, chashgher, taghna, khasaba, and red shirts had fallen out of favor perhaps 40-50 years earlier, and that it had been a long time since he had encountered them . According to Djanigian, 50% of men wore the fez. They wore overcoats made of silk produced in Peria (an Armenian-populated area in the Esfahan Province of Iran) and elsewhere, or made of manousa (checkered, colored cloth) produced in mostly in Agn, but also in Peria and Ayntab. They wore jackets made of cloth and Persian wool; belts produced in Agn or elsewhere; thin linen shirts; moudjags (a sort of shoe wear, slippers), made of leather imported from Zile or of seg (a delicate, fine leather, dyed in various colors, and usually made of goat hide) imported from Kharpert, Arapgir, Sebastia, and other cities. Meshin (the soft leather of sheep hide) was produced locally in Agn but was sent out of the city to be dyed . This family most probably hailed from Agn, and the photograph was taken either in Agn or a nearby city. The family is unidentified, but the photograph is in the Jamgochian collection. Therefore, it is presumed that the family in the photograph was either related or friendly with the Jamgochians (Source: Jamgochian collection, USA). A wedding gown that belonged to the Jamgochian family. It is currently housed in the Ararat-Eskijian Museum in Los Angeles. Many wore linen shalvars dyed with indigo (a blue dye, and the product of the indigo plant that grows in India). As for the wealthy and those who had traveled to Constantinople and other big cities, they mostly dressed in European fashion, wearing the setri (coat), pantolon (drawers, underpants), potin (or potig, shoes), kalosh (galoshes), etc. .
Djanigian reports hearing from the elderly residents of the city that in the past, women had worn a type of fur coat call choban-yaka (“shepherd’s collar”). The coat was lined, both inside and outside, with fur, with the exception of a few sections in the front and back, where the cloth was visible. When the taghna and khasaba fell out of fashion, women wore the taghik (keche or kecha) on their heads . The taghik was usually the size of the wearer’s head, with straight sides and a round top. The inside was lined, and the outside made of the same material as the fez. The hat had a veil of black silk in the front, and tapering towards the sides (puskul). Into the puskul were sewn five, 10, and 20 kurus coins, called djagads, and only half-visible. The lower part of the hat featured a veil embroidered with flower patterns (yazma). The hat featured yet another veil, which was folded triangularly and sewn to the section beneath the quadrant of the hat to the rear of its peak. Two corners of the veil could be secured with a pin to the peak of the hat on the other side of the chin. This veil was made of delicate, white linen, which was called nerknag . 1) From left to right – Akabi Jamgochian (born Janigian, the wife of Avedis Jamgochian, 1861-1940). Seated is Avedis’s mother (name unknown), and in her lap is Araksi Jamgochian (the daughter of Melkon, Avedis Jamgochian’s brother). 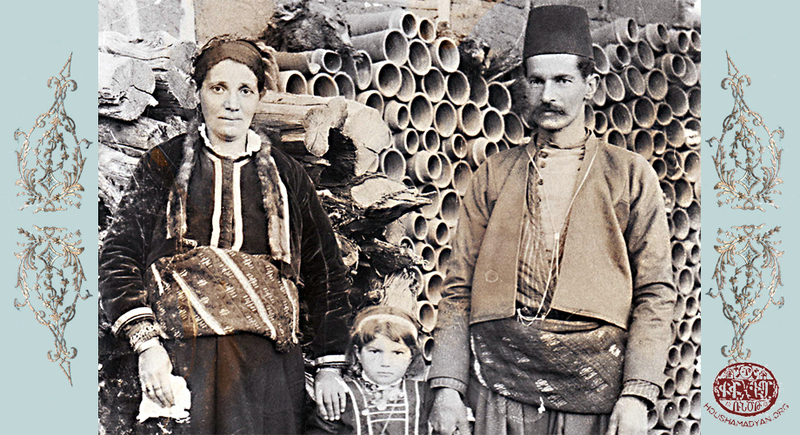 The photograph was taken around 1894, and it depicts, side-by-side, Istanbul-influenced contemporary attire (worn by Akabi) and traditional attire (worn by Avedis’s mother). The latter is wearing headgear and a jacket made of animal hide, lined with thick, valuable furs (Source: Jamgochian Collection, United States). 2) Agn, 1909. Seated is Parsegh Shahbaz (1883-1915). During the frigid winters, men too kept warm by wearing these heavy fur-lined jackets, made of the hide and fur of various animals (Source: AGBU, Nubarian Library, Paris). 1. Agn, circa 1885: Wedding portrait of Nicolas and Makrouhy Derghazarian Gabrielian. Photo by A. F. Gabrielian (Source: PROJECT SAVE, Armenian Photograph Archives, Watertown, MA, courtesey of Syranoush Movsesian). 2. 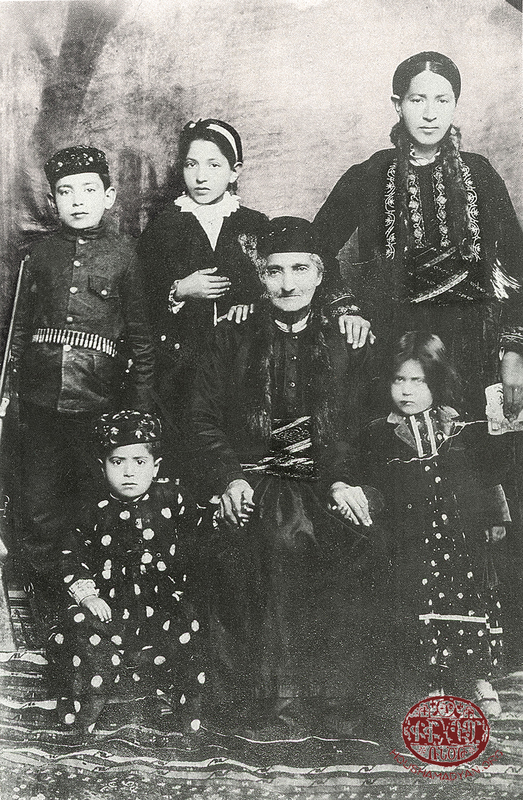 Agn, circa 1897: Makrouhy Gabrielian (née Der Ghazarian) and Nicolas Gabrielian with their children. Their last photograph in Agn; the family emigrated soon after to the USA, probably to New Jersey (Source: PROJECT SAVE, Armenian Photograph Archives, Watertown, MA, courtesey of Syranoush Movsesian). Djanigian mentions that with the use of such hats was falling with each passing day. For example, the fez, which had been in constant use for 20-30 years, had a front-hanging veil, djagad, and yazma, but did not feature a yazma that could be secured below the hat. It seems like they were replaced by hats with semi-erect veils that hung behind the hats, from their peaks. These hats weighed 40-50 tram (or trakhma, with one trakhma equivalent to 3.73 grams), and sometimes reached the shoulders of the wearer . According to Djanigian, as early as a few years before his recordings, many had already ceased using such hats, which were as heavy as their predecessors, and had begun wearing simple yazmas made of silk. Indoors, for example, many only wore their yazmas . As for the women’s overcoats, Djanigian mentions that for some years before his writings, they had fallen out of favor, and had been replaced by gowns (fisdans). Gowns were usually sewn from multi-colored patches of silk and wool cloth, and the cloth known as manousa in Agn (a wool cloth named after the city of Manisa). On top of their gowns, women would tie Persian scarves around their waists as belts. They would also wear various furs and skins (ibex, ermine, squirrel, calf, etc.). These skins and furs were combined with various multi-colored European linens, cloth, kazmir (a type of silk), etc. .
Djanigian also mentions that when outdoors, women wore a wide coat made of cloth (binish), which slowly fell out of favor and was replaced by the feradje (faracha, or women’s coat). The latter was made of cloth, Atlas silk, and other materials. He mentions that at the time of his writing, some women had begun wearing multi-colored silk coats that were produced in Diyarbakir and other towns (called charshaf) . Some used the feradje to cover their faces. However, according to Djanigian, by the time of his writing, the custom of women covering their faces had already disappeared, and there were even women who did not consider it inappropriate to visit the church or make social calls without wearing the feradje . 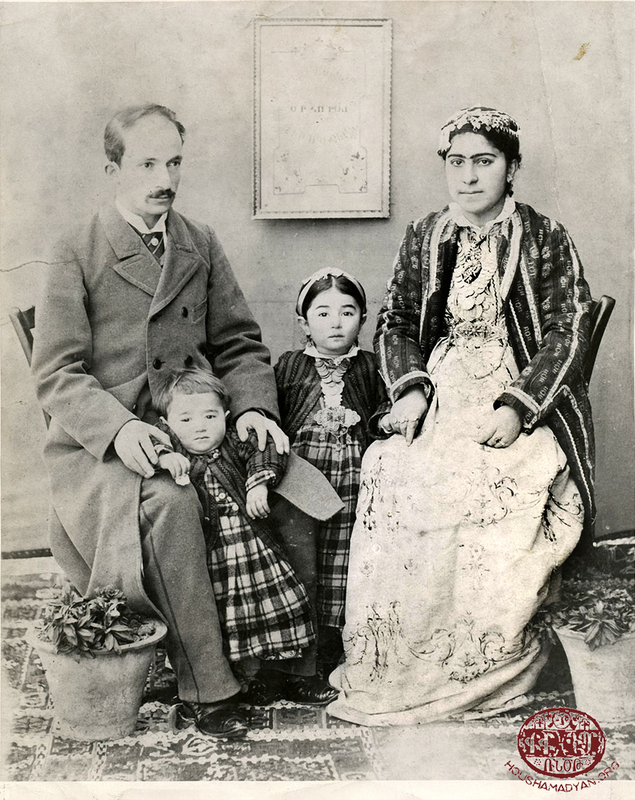 Seated, left to right – Melkon Jamgochian (Avedis Jamgochian’s brother), and Mariam Jamgochian (Melkon’s wife). 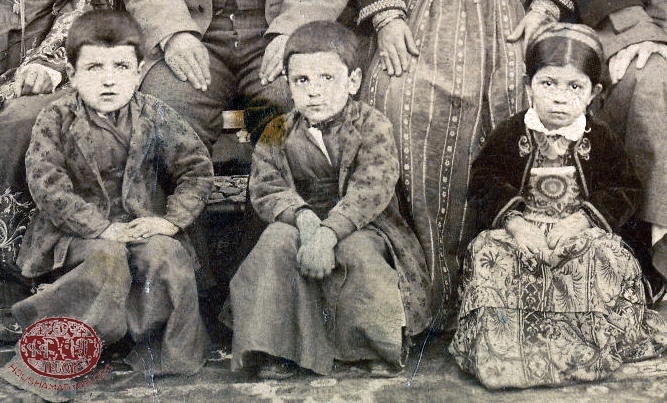 The children, from left to right – Matteos and Eliza, Avedis and Akabi Jamgochian’s children. The photograph was taken around 1892. Melkon was killed in Agn during the 1895 Hamidian massacres (Source: Jamgochian collection, USA). Nazig Avakian, Haygagan Joghovourti Daraze [National Costumes of Armenia], Yerevan, 1983. Hrachia Adjarian, Tourkerene Pokharial Parere Bolsi Hay Joghovrtagan Lezvin Mech Hamemadoutyamp Vani, Karabakhi yev Nor-Nackhichevani Parparneroun [Words Borrowed from Turkish in the Daily Dialect of Istanbul Armenians, Compared to the Dialects of Armenians in Van, Karabakh, and Nor-Nackhichevan], Moscow/Vagharshapat, 1902. Jamanagagits Hayots Lezvi Patsadragan Pararan [Interpretive Dictionary of Contemporary Armenian Language], Volumes 1, 3, and 4, Hrachia Adjarian Institute of Linguistics, Yerevan, 1980. Hayots Lezvi Parparayin Pararan [Dialect Dictionary of the Armenian Language], Volume 4, Hrachia Adjarian Institute of Linguistics, Yerevan, 2007. Sdepan Malkhasyants, Hayeren Patsadragan Pararan [Interpretive Armenian Dictionary], 1944. Etvart Malkhasyants, Arti Hayereni Patsadragan Pararan [Interpretive Dictionary of Modern Armenian], Volume 2, Yerevan, 1976. Türkçe/Osmanlıca-İngilizce Redhouse Sözlüğü [Redhouse Turkish/Ottoman-English Dictionary], SEV Matbaacılık, İstanbul, 2000. 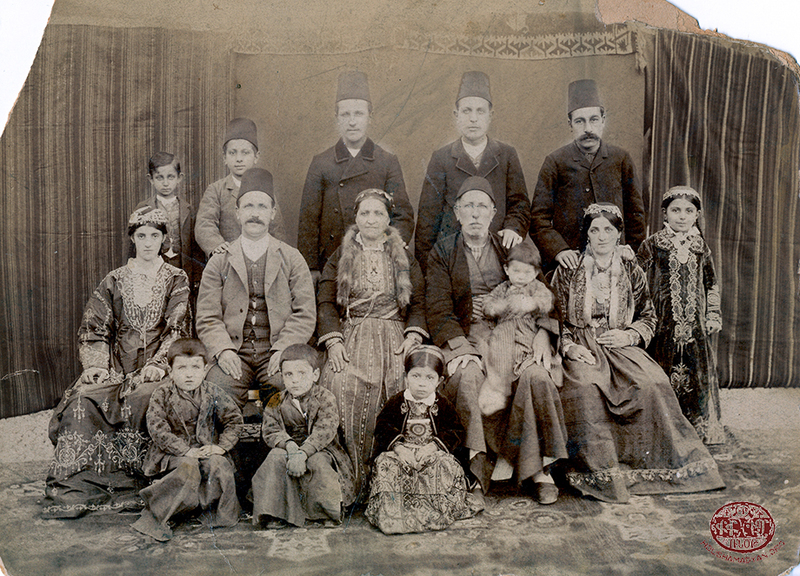 An Armenian family in Agn (Source: Pierre Ter-Sarkissian, Jean-Claude Kebabdjian, Michel Pazoumian, Photographies arméniennes: Scènes et portraits, 1880-1930, Paris, 1983). Arakel Kechian, Agn yev Agntsin, 1020-1915 [Agn and the People of Agn, 1020-1915], Volume I, Bucharest, 1942, page 15. H.G. Djanigian, Hnutyun Agna [Antiquities of Van], Tbilisi, 1895, page 136. A red fez with a black tassel worn by Avedis Jamgochian (1861-1940). Avedis was born in Agn, and graduated from the Euphrates College in Harput (1881). In 1892 he emigrated to Manchester (England), where he found success in the textile trade. In 1911 he settled in the city Glendale, called Tropica at the time, outside of Los Angeles. He died in the United States (Source: Jamgochian collection, USA).